At just 200 microns in diameter, this may very well be the smallest camera in the world. Patrick Gill, a senior research scientist for a technology licensing company named Rambus, has developed a camera sensor that can capture pictures while still retaining a near-microscopic size. 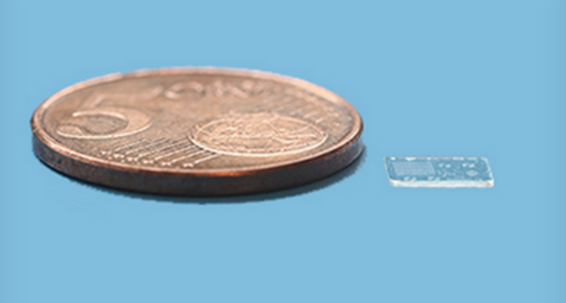 The sensor itself is just a small piece of glass to the human eye. It doesn’t even have a lens, considering its size. So how does it work? The piece of glass has a spiral pattern etched onto it, which is pretty much where the light goes through. The data from that just comes out as a spherical ball of light, while the sensor captures the scene. Once both the light and scene are put together through computerized software, the final picture is formed. 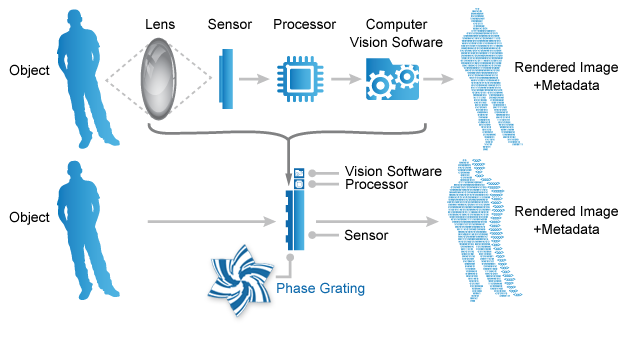 The sketch below illustrates the difference between how regular cameras operate and how the Rambus technology works. As a result of the small sensor, the picture comes in an incredibly small resolution of 128 x 128 pixels (I like calling it .1K display). But Gill doesn’t want the camera to be a replacement for other cameras. In fact, it’s more of a replacement for motion sensing. The sensor, without a lens, is even better than a regular camera at light detection; it doesn’t lose pixels to oversaturation or focusing because of that lack of lens. Gill’s entire motive for this device is to “add eyes to any digital device, no matter how small”. This camera is still in development, but it’s already being considered for implementation in home security, medical imagery, and devices that use gesture control. This may not just be a fancy gimmick, but an incredibly useful and versatile tool that’ll one day cover a wide range of industries. Title doesn’t make any sense at all.